Brenna Wilson and Iris Magill are looking forward to a unique new international study opportunity in the Netherlands at StFX partner exchange university, HAN University of Technology—as scholarship recipients. The two StFX human kinetics students have each received the HAN University of Technology Summer Program Scholarship, valued at €1,620 or $2,445 CAD, that offers StFX students the opportunity to study at the HAN Faculty of Health and Social Studies for their 2019 Summer School: Health, Social Work and Sport. This program consists of three, one-week courses, starting May 20 and ending June 7. The scholarship pays the tuition fee and covers accommodations, local transportation, and a field trip associated with each course at HAN University of Technology, located in the city of Nijmegen, in eastern Netherlands, near the German border. “It’s a unique opportunity and a good opportunity to take some other courses...I’m excited,” says Ms. Wilson, a third year student from Saint John, NB majoring in kinesiology in the BSc human kinetics program. Ms. Wilson says she is looking forward to meeting new people, to seeing how classes are taught there, and to learning from professors in courses that range from sports event management to issues in health care. She says she is looking forward to gaining new perspectives and new creative ways of thinking from the experience. It’s a sentiment shared by Ms. Magill of Ottawa, ON, a second year BA in human kinetics student taking a minor in sport management. “It’s such an interesting opportunity,” she says. “I’m so interested in the courses offered, they’re all so different, and to compare and contrast how things are done there and here. Ms. Magill says she’s had a travel bug lately to explore different cultures and at the same time she’s been trying to get involved in as much as she can and build her resume. She says she is also looking forward to building connections. 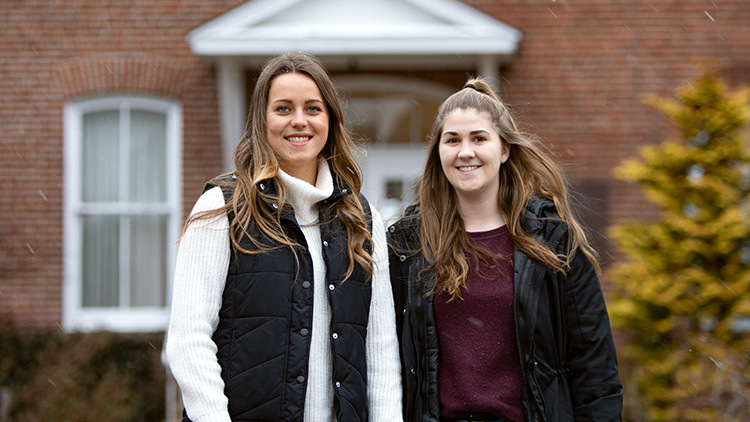 Both Ms. Wilson and Ms. Magill say they’re hoping the experience will help give them further focus on what they’d like to do after finishing their undergraduate degrees at StFX. They both say they’re eager too to bring back different ideas and all they learn when they return to StFX. To be eligible for the scholarship, students had to be in either the BA or BSc human kinetics program, or the BASc Health program at StFX, be in good academic standing, have a focused professional and academic interest in human health and well-being, and have a curious, independent, open-minded and adventurous attitude.